Today I share with you the January 4, 2019 notice from National Adrenal Disease Foundation. 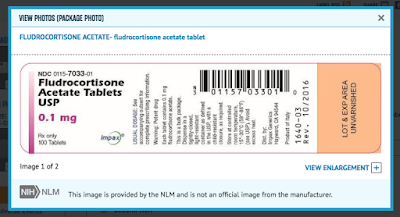 It provided an update for the ongoing fludrocortisone shortage many US adrenally-insufficient patients are facing, including Cushies without adrenal glands, like me. I recommend that you provide a national drug code (NDC) when you call your pharmacy to ask them to find fludrocortisone acetate for you. The pharmacist tech will simply punch this NDC into their computer to locate this medication. NDC for IMPAX/ Global is 0115-7033-01. 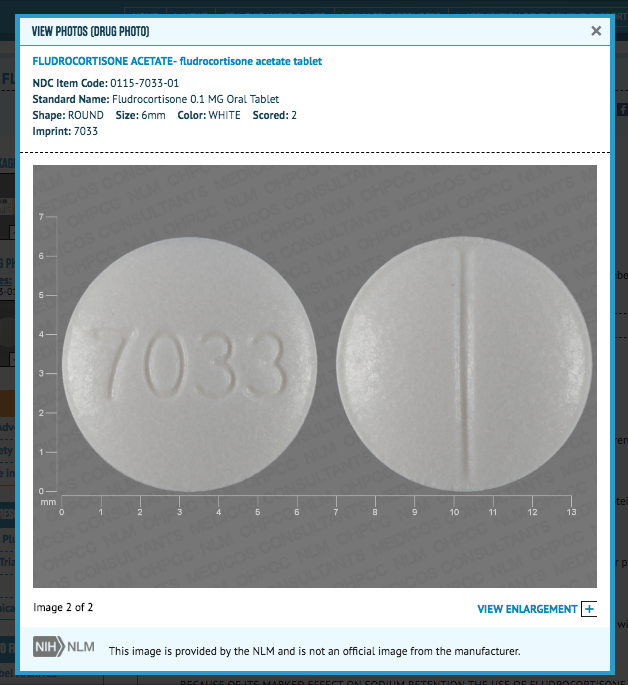 According to the U. S. Library of Medicine, the NDC for fludrocortisone acetate manufactured by IMPAX/ Global is 0115-7033-01. In addition, I have my endocrinologist write my prescription for fludrocortisone for 0.1 mg bid or twice daily, even though I only take 0.2 mg fludrocortisone during the summer. This allows me to build a small stock pile of this life-saving medication during the other times of the years. It is critical for us to be prepared for times of natural disasters like fires, hurricanes, snow storms, manufacturing delays, shutdowns, or shortages. We have to be smart about how to keep ourselves alive. Download NADF's original statement here. 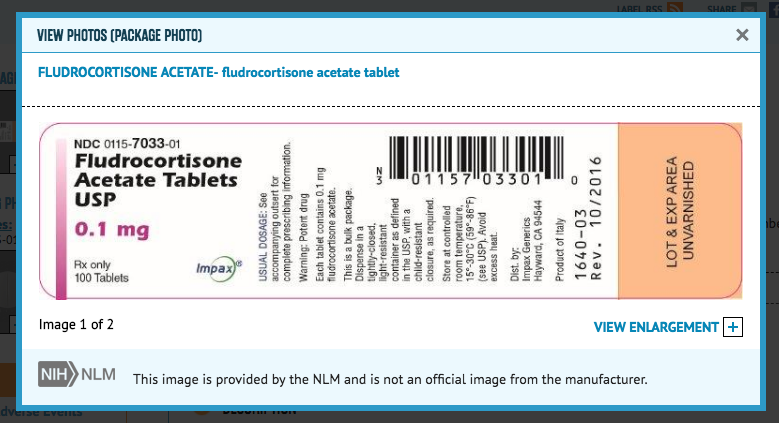 "This is an important update on accessibility of fludrocortisone acetate. Barr/Teva has informed us that the company is phasing out their production of fludrocortisone acetate. We want to reiterate that there are other manufacturers of our life-preserving aldosterone hormone replacement fludrocortisone acetate including Impax/Global Laboratories, Inc. and for those with government insurance, AvKARE. However, AvKARE is experiencing a manufacturing delay so that product may also be temporarily unavailable. To complicate matters, McKesson is one of the largest pharmaceutical distributors in the USA, and has exclusive contracts with many manufacturers on the supply side, as well as many of the large pharmacy chains and mail order pharmacies on the distribution side. In this case, McKesson has an exclusive contract with Teva/Barr for fludrocortisone acetate, and does not supply Impax products.This means that patients might find ordering fludrocortisone acetate from one of the larger pharmacies as impossible, because that pharmacy has McKesson as their pharmaceutical product supplier. You can share your experience getting your fludrocortisone prescription filled by taking this NADF survey. It's short--only four questions. 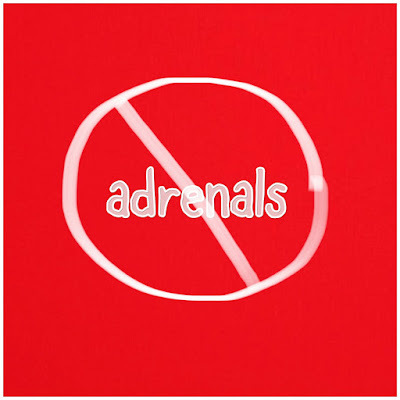 Doctors generally scare patients from taking extra cortisol (ie updosing or stress dosing) after pit surgery, adrenal surgery, or removing both adrenal glands (BLA). This is rich. They barely believed that we had Cushing's in the first place, yet now we must respect them as experts in the damage caused by excess steroid replacement. They rail against the damage of long term cortisol replacement TO CUSHING'S PATIENTS, as if we don't know, as if we aren't still living the nightmare of excess cortisol made in our bodies. Many doctors refuse proper cortisol evaluation, imaging, or simple blood tests to evaluate related pituitary and adrenal hormones even when the patient asks. Doctors delay diagnosis in every way possible, leaving us with rampant cortisol excess for 7-10 years on average. Updosing for illness is life-saving in the short term. The long term doesn't matter much if we are dead and not here to enjoy it. All bodies use cortisol to fight off infection. Our bla bodies will fight off infection but it will use up our daily dose of cortisol replacement to do it, leaving us under-replaced and on a path to adrenal crisis. Diarrhea and vomiting both cause dehydration which alters how much fludrocortisone/ aldosterone replacement we have to rebalance our fluids. If a BLAer vomits, dehydration is an issue but the more dire concern is that oral meds won't be absorbed before vomiting again. In this case, we can take 20 mg HC under the tongue, take anti nausea medicine like zofran or phenergan to hold off the vomit. If we can't take extra cortisol by mouth, we must go to the ER 1) for IV fluids due to dehydration and 2) IV hydrocortisone. For diarrhea, dehydration happens but we can easily take oral steroids under the tongue to keep AI and AC at bay. Those of us who have D instead of V in adrenal insufficiency have more time to figure things out. After 4-6 bouts of diarrhea, then we have to go to the ER for IV fluids even if we keep the cortisol dose down. So it is a tricky flowchart to follow but we must do it when we are sick. Docs tell us to just stress dose with fever. This is not true. Many of us need more cortisol meds for urinary tract infections, simple colds, upper respiratory infections, pneumonia, shingles, pain from kidney stones, etc. BTW I've had all those post op BLA. I needed more cortisol that the 20-25 mg HC i was taking daily. Once, I was feeling very tired and worn down one Monday. All I wanted to do was sleep. Wednesday morning I coughed once. I knew I was sick. I went to urgent care that same morning and I had pneumonia. Our bodies will tell us it needs more cortisol. We must learn the cues, trust ourselves, take doc advice into consideration but ultimately take meds as we need to, without worry of judgment or repercussion from the docs. They don't live without adrenal glands. We do. All 230+ in the BLA group do. That is why I place 40% of my faith into the answers I get from BLAers, 10% from doctors, and 50% from my experience, knowledge, and instinct. I encourage you to gain enough knowledge and surround yourself with experienced Cushies for you to do the same. Back in my day, when I was first testing for Cushing's in 2007, there were no online patient portals. It would take two to three weeks for the results from simple blood tests to come in, so said the doctors and staff. Determined not to wait until medical staff called me with results, I bought a fax machine and a second phone line. I wrote my own 800 fax number on the lab requisition in the CC place. I told the labs it was my pcp doctor. They believed me and duly entered that number into their system. I would get my results via fax at the same time the ordering physician did. No additional waiting. https://labtestsonline.org/ is the best resource I've found that gives simple yet thorough descriptions of the test, the reasons doctors order that test, and most importantly, what high or low results mean. I soon realized that doctors and staff tell us results take much longer to come in because they are building in the time it takes for the doctor to review each person's lab work and pass along next steps to their staff: call patient and schedule a follow up, add or change medication, refer to specialist, etc. Then we waited for that staffer to make it through those calls to the patients, adding days of waiting. 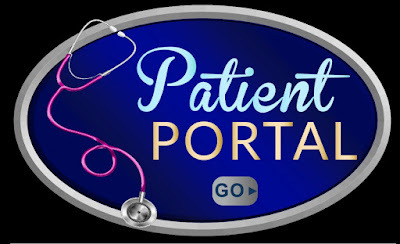 Be thankful that we have patient portals now, and many times, we only have to wait 48 hours after results are released to the doctor before they are automatically released to us. 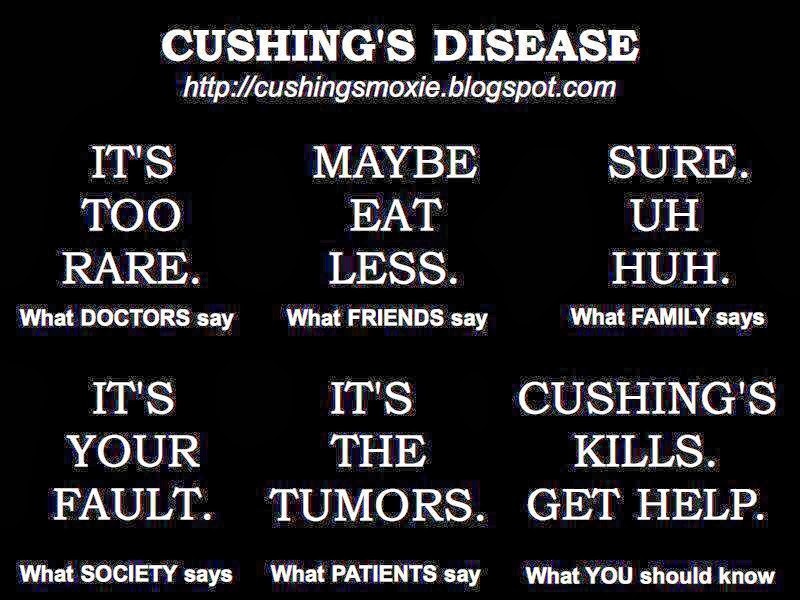 Today, I share with you some wise words from a post op Cushie and patient advocate, Susan G. She moderates the Facebook group, The Many Faces of Cushing's. Spend some time learning about your health insurance coverage. "Open Enrollment for insurance will be starting very soon. 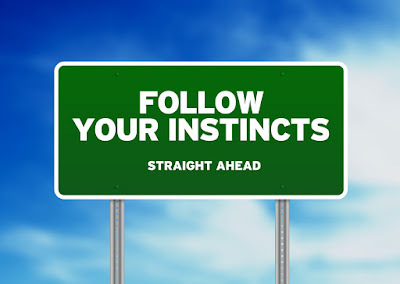 Now is the time to look over your plan very carefully and make any changes. 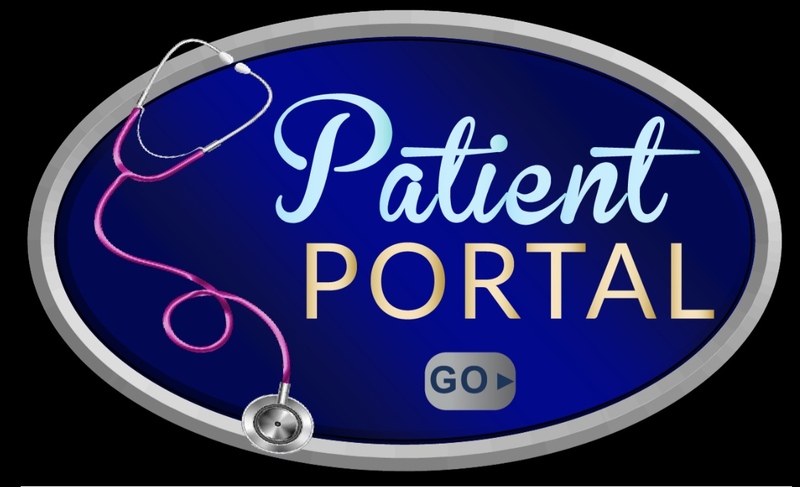 Look at your provider directory online, and search for some of the major medical facilities (MD Anderson, John Hopkins, Cleveland Clinic, Emory, Mass General, Cedars Sinai, etc). See if LabCorp and Quest are covered medical labs. Look at your out-of-network requirements/costs. If you are going to aggressively seek treatment (especially surgery) in 2019, find a plan that gives you a wide range of options. For instance, if you know you want Dr. Chiang to perform your bilateral adrenalectomy, move to a plan that lists him as a provider. Your monthly premiums might go up, but that will be less expensive than paying for surgery out-of-network. Don't assume that the "standard" (more expensive) is better than "basic" (less expensive). Because I am post-surgery, and most of my medical expenses are lab tests, I switched to the Basic plan because they cover labs at 100%. Yes, if I end up having to have surgery the hospital costs will be higher, but probably not much more than I've saved on premiums throughout the year. Don't assume that the lower deductible plan is better. Look at the various copays and premiums. A high deductible may never be met (if you are fortunate and don't have to see many doctors) but those premiums are a guaranteed expense. Finally, remember that this is an election year probably one of the most important of our lives. Denying coverage for pre-existing conditions is still a possibility, and Medicaid is on the chopping block. Vote for your Senators and Representatives like your life depends on it -- because this year it might. Deductible is the amount that you will be required to pay out of pocket before insurance starts paying anything. Annual out-of-pocket is the total amount you will have to pay. In other words, it includes your original deductible and then the amounts that insurance won't cover ($50 emergency room copay, 20% of surgical procedures, etc.). Once you hit the OOP, you pay nothing the rest of the year." I sit on my back porch staring at the flower across the yard. I hear the birds sing in the distance. I hear my service dog's nails hit the pavement. I feel the heat of the intense Texas sun on my body, while tears fall down my neck. I feel numb in this world. I feel lonely and unfulfilled. I fill the day by playing a few games on my phone throughout the day. World Chef and Best Fiends, if you must know. I scold myself that this is the reason I can't get anything done. I vow to wake up the next day with a plan, a list, with focus. I am so behind. I have to get some things done. 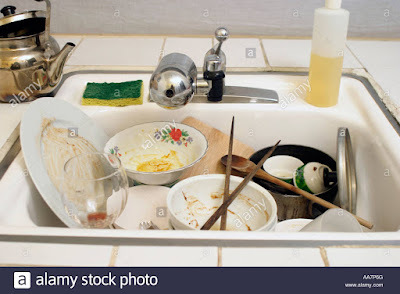 So I document all the tasks that need my attention, the bills that must be paid, the items that can no longer go unattended. I go to sleep with some hope that tomorrow will be better. Then, it's not. It is the same as it was yesterday and the day before that, and the week before that. That's the way it is with depression. Our bodies are suspended in time -- part of today but not fully --while the world continues to race past us with each second that goes by. We ourselves don't move but we constantly feel the wind of being left behind. I have no motivation -- for even fun things, for important things, for myself, for my family. Even with a list in hand, I have no 'get up and go.' I reprimand myself to get up out of the bed in the morning, and when I am finally out of bed, I long to go back 'home.' That's all I want to do... sleep. Even when I wake from a three hour nap, the relief I feel is brief. My mind caves under the pressure of consciousness. I didn't cook dinner. Again. I didn't go to the grocery store, and I didn't order groceries to be delivered. Again. I didn't send my husband a grocery list for him to stop at the store on the way home, because after 13 years together and with a 10-year-old child, he never knows what to buy for us. I left my child alone again, with only the company of the TV to stimulate her brain and senses. I feel great guilt over this. TV is bad for kids. Video games are bad for kids. Yet what do I expect her to do when I leave her alone during summer? If I can let it go, I do, but on bad days like today, I realize that my poor child has spent far too many days in front of the TV while Mama slept. I realize that is not the priority for worry today, but each of these thoughts weigh me down, trapped in a world of things I can not do and can not change. This is my life after Cushing's. I don't know how I got here, and I don't know how to get out. I see no glimpse of my old self, of my old life, and yet I see no path forward for me to reach a new level of happiness just as I am. I feel the weight of the world on my shoulders. Ok maybe not the world but definitely the weight of my life and that of my family. I don't know how to carry this guilt and anxiety about the guilt with me anymore. I don't want it. I want the problems to go away, and I don't want to feel this way anymore. Yet, I don't know how it will ever go away when so much of the load falls on my shoulders. I have outsourced and paid heftily for everything I can. I pay housekeepers to come weekly to clean the house and wash our clothes. I have already perfected saying no. I say no so much that when I want to do something, there is no one around or nothing to do. The remaining jobs are mine, and I can't do them. I don't want to do them. They are too hard. I am a wife and a mother, and I don't feel very good at either. I'm lost in the mundanity of my world. I don't want to be the inventory clerk of my house. I don't want to be responsible for cooking dinner every day and feeding my family and myself three times a day. I don't want to be asked where something is. I don't want to open to mail and pay bills. I don't want this to be the only thing I do with my day, so I avoid it. When I try, I quickly realize the limitations that Cushing's has placed on my body and mind. The chores go undone for another day. With so much on my "To do but I don't want to do" list, I never get on to anything else, anything that I want to do, anything that piques my interests and makes me smile a bit. You see, I don't have the energy for those things either. On days when the schedule is empty and I could spend all day working on my interests and hobbies, I don't. I don't feel like it. I think about things I want to do when there is no time to do it. My curiosity isn't in sync with my abilities or mood. I feel guilty about that, too. As my day continues, so do admonishments I heap onto myself. Why don't I use my time more wisely? I'm such a phony because I am all talk. I have been talking about becoming fluent in French and moving to Europe, for how long? 30 YEARS?! I talk about going to the French movies that play once a month at the local college. I talk about studying the ancestors in my family tree. I talk about all the ways I need to renovate my house, projects to complete in my back yard and my front garden. I talk about how I have several children's books ready to write and how I just need to write them down. I even have a reminder on my phone to remind me daily to "Write for 30 minutes." Yet, I don't. I don't write, and I don't do any of the things on a daily basis that bring me joy or excitement. I feel guilt over that. Who can make me do what I want besides me? Who stands in the way of me doing what I want to do? Me. All blaming fingers point to me. I have 24 hours of time every day, just like you do. I am sensitive to all that I am *not* doing every day. I see around me and I hear the messages... "Live today like there is no tomorrow." I know what I am supposed to do, but I just ... can't. I'm burdened by all the living I'm supposed to cram into one day because those days turn into my life. Yet, I do none of those things that I say I want to do. I just don't want to do anything. The days pass slowly into the next, with the only difference between them is how late I woke up, whether I managed to wear real clothes or even shower, or am I lying down on the couch or in the bed when my husband comes home. There are no other highlights in my day. Sure, I have my daughter. As much as I love the dickens out of her, she is learning to be independent. As she does that, she realizes that she doesn't have to agree with Mama all the time. She is her own person, with her own ideas and desires. As outspoken as I am, I still sit here dumbfounded that my daughter who inherited this gene wields it against me. I have such a low tolerance for the arguing. I can't withstand the constant questioning of why I said no. With multiple explanations with more depth, she still demands more of me. I snap to break the intensity. No TV for you. No you can't go to your friends. She stomps off. Doors slam. I sit and wonder how on earth am I supposed to adapt or how will she? I can't pass down life skills like coping when I feel like I can't cope. My attempt to squelch the increasingly stressful episodes leave me feeling like a failure as a mother. Why can't I be more patient? She is just a kid. Why does she act that way? She must have learned it from me. She sees my inability to cope with stress, and she is talking back and acting out like I do. Either way, it is my fault. I'm the parent. I'm the mom. My child is a reflection of me. No one cares that I am sick. I feel like I can't win. I think of all the expectations that I don't meet and I don't care about meeting. Yet the expectations I have for myself, for this life, I just can't let them go. How do I forget everything I always wanted for my life? How do I throw all that away and dream up new dreams that are so small, they are barely an accomplishment? I have no expectations, and I have no goals. Why? Because I have held tight to small, achievable goals, and when the deadline comes up, I'm a no show. I flake. I can't hack it. I've learned not to make such deadlines for myself. I've seen the self-help shows and read the books and articles. I need to be more grateful for what I have. I run through all the things for which I have gratitude. I write it down only to completely forget about it a few days later. My mind is like a sieve. With all the things I forget, why won't I let myself forget all the things I never accomplished and the things I've done wrong? How do I focus on today, when today is filled with no motivation and wanting to check out of this world with a nap? How do I focus on what I want when I have no ability to achieve my goals? Depression is the cycle of impossibility that never lets you see the glimpse of the light saying you can. That it will, somehow, happen for you--that you can do it. Depression is sitting here wondering why you are just sitting here. Depression is knowing you are not doing enough with your time and your life and not being able to do anything to self-correct. Depression is spending weeks like this and only realizing later that you are indeed depressed. 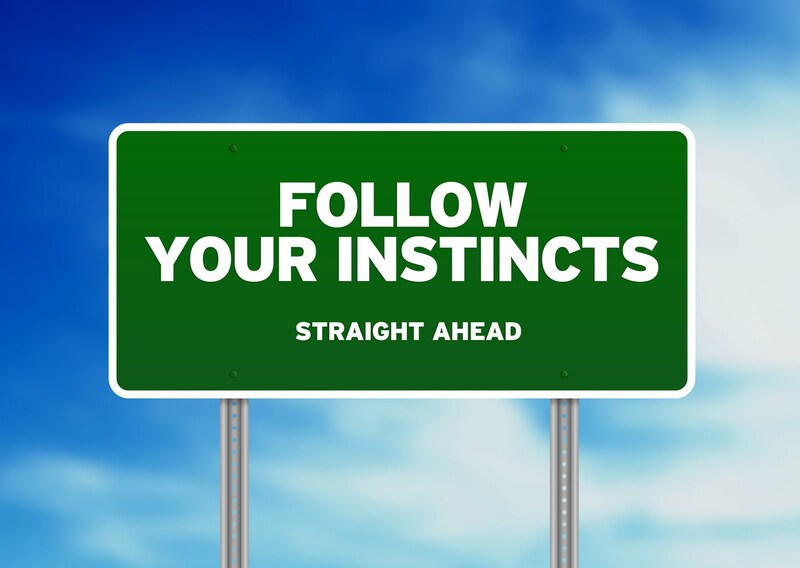 No other outward signals tell you that this is happening to you. Again, the weight of this discovery is on your shoulders to resolve, next to the heavy load you carry. Once I realize I am depressed, I dutifully make the appointments with my psychologist and psychiatrist only to realize it is Friday, and I will have to muddle my way through the weekend and next week until 'the next available appointment' on Wednesday. When the thoughts are swirling around my head so fast I don't know where else to put them, I come to a blog I have maintained for a decade. I write it all down. On the one hand, I hope that writing it down will remove it from my head space. On the other, I hope someone who reads this blog will see herself in these words so she knows she is not alone. I'm just hoping for my mind to quiet and to let me see some sparkle of hope that tomorrow can be different, that tomorrow can be better. I close my eyes and check out of this world, hoping that my respite from the worry over my pain, emotions, and thoughts will give my body a few hours to reset and start again. Technology teaches us that when things go haywire, log out and try again later. I have to put my faith in naps, because it is the only tool in my tool box that I can grab now. I'll deal with all the guilt of inactivity and non-accomplishments later. For now, my brain and my heart need a break. I reach for the only thing that quiets my mind from the weight of the indignities. I crawl into bed for a sweet nap and hope that I can tomorrow. Think back to all your doctors appointments: How many times were you offered steroids for treatment? Steroids are passed out like candy in medical offices, urgent cares, and ERs these days. Every time, the doctors will assure us that we can't get Cushing's from these low dose steroids, even if used long term. We have always heard quite a different story from patients in our online community. Now here's an article from a medical journal saying the same thing. Finally. NOTE: Thanks to my Cushie friend Susan F for the find. Many tests must be run to rule out the diagnosis of Cushing's, yet we hear from many who suspect Cushing's that their primary care doctors or endocrinologists REFUSE to order these tests because they say Cushing's is so rare that it is impossible to have it. Most just say we have PCOS and give us anti-depressants and metformin. Yet, what doctors don't tell us is that Cushing's must be ruled out to make the diagnosis of PCOS. In order to rule Cushing's out, doctors must run tests to gauge the status of all the hormones of the hypothalamus-pituitary-adrenal axis, succinctly called the HPA axis. Doctors will try to run thyroid tests and tell you that you are fine. No no no. They just order ALL the hormones produced by or related to the pituitary and adrenal glands. So, what can you do to ensure the doctor orders the tests and you don't waste your time and money on a doc that won't do anything to help you? Prepare for your doctor's appointment. Read the tips I wrote 10 years ago about how to prepare for your doctor visit. 2. Make sure your symptom list is comprehensive. Do not start off with weight gain as your main symptom. Docs will take that and talk about diet and exercise. You will never get to talk again. That doc will go on and on and you will feel defeated. Peak their curiosity by relaying this myriad of strange and seemingly unrelated symptoms. I listed the symptoms in a specific order to maximize impact. 3. Be prepared to be blown off. That doctor, not matter how good he/she is supposed to be, will act like it is impossible for you to have Cushing's. It happens all the time, to nearly all of us, so don't be alarmed. Knowing this in advanced should make you get serious about the task at hand. That doctor is the gatekeeper who will decide what happens to you next. Please understand that it is your job to make sure you get what you need out of that appointment, namely lab orders or imaging orders. 4. Are you sick or not? Sit up straight. Be confident. You know your body better than anyone, and you know something is wrong. Don't let doctor interrupt you and dismiss you. Your life depends on you standing up for yourself. Now is not the time to diminish your symptoms and downplay its effects. If you find your doctor doing that for you, you must stand up for yourself and get the help you came for. 5. Psyche yourself up and refuse to leave without being properly evaluated for Cushing's. When the doctor begins to tell you how Cushing's is so rare, remind him/her that doctors are taught in medical school to look for the one diagnosis to explain all the symptoms, not have several scattered diagnoses. Also, tell them about the probability of having Cushing's, and how if all the test results, symptoms, and imaging results suggest Cushing's, it is likely Cushing's. If it walks like a Cushie and cries like a Cushie, it's a Cushie. 6. Be knowledgeable and medically aware. I will list all the labs that will give you the big picture about your hormone health. I know what all of these tests are, and you need to know them, too. Spend some time on this super helpful site, Lab Tests Online. Search for the test in the search box. Then scroll down to common questions. My favorite section is "What do my test results mean?" This section is awesome because it tells us what both high results and low results mean. I have been using this site for over a decade, and it has been the cornerstone to my medical knowledge. • midnight cortisol serums x 10, completed at the lab at the local hospital. with patient's name, date of birth, test name and frequency, and diagnosis code. 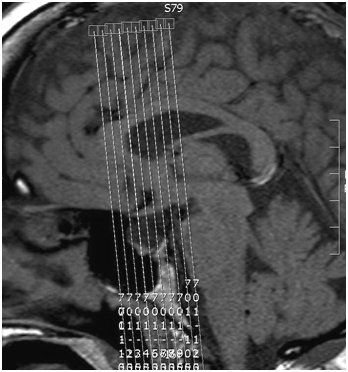 pituitary at 2-3 millimeter slices. — Images are taken. Then IV contrast is given while images are taken. This is the dynamic part of the protocol. These images are critical for radiologist and neurosurgeon to see how the contrast dye is absorbed. Normal tissue will absorb the contrast uniformly, but tumors/adenomas will not absorb the contrast. Learn more about dynamic protocol of the pituitary. 7. Persistance is key. So is a smile. Have a "Get It Done," "Won't Take No for an Answer", but "Catch more Flies with Honey than Vinegar" attitude. Persistance is key. So is a smile. 8. It's not you. It's them. Remember that some doctors are jerks and decide if they will help you. In the end, it could be them and not you. If you realize you will not get anywhere after concerted efforts, tell the doctor that you are disappointed in this service, and you won't be coming back. Or, like many Cushies have been reduced to, hold back your emotions for as long as you can and burst into tears in your car. It happens, and it isn't your fault. Read this link about some doctors being bad and you will realize, this is an uphill battle even if we didn't have Cushing's. It is just a dire situation once we finally find the name to what ails us after so many years. I've included this graphic only as a sample, not as the gospel. Why? 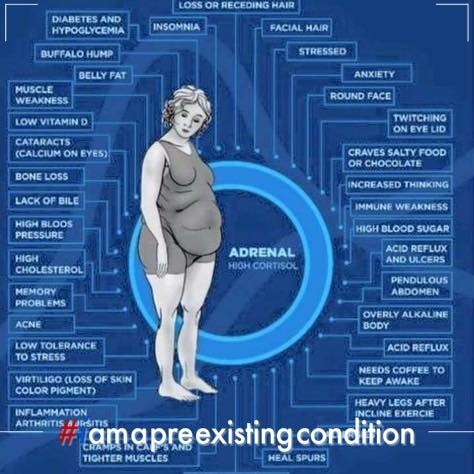 Because this and the many graphics found in Google images only apply to patients who are FLORID, meaning cortisol results will all be high. These processes do no apply to CYCLICAL patients like me, who despite having normal UFCs and suppressed on the low dose dexamethasone suppression test, STILL DO HAVE CUSHING'S. I hope this helps prepare you for your visit to the endocrinologist. Despite Cushing's being an endocrine disorder, these doctors are convinced before you even talk that you don't have it. They can tell just by looking at you! Understand the wall that stands before you, and figure out a way to get to your goal: a proper Cushing's work up. 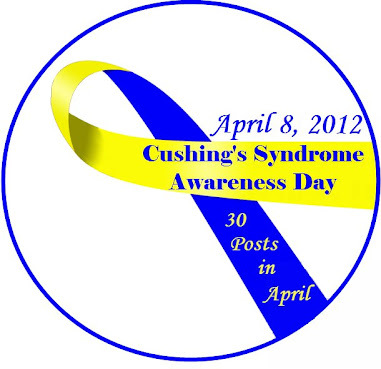 I've spent the last 11 years of my life surviving Cushing's and its aftermath by immersing myself in the patient community online. 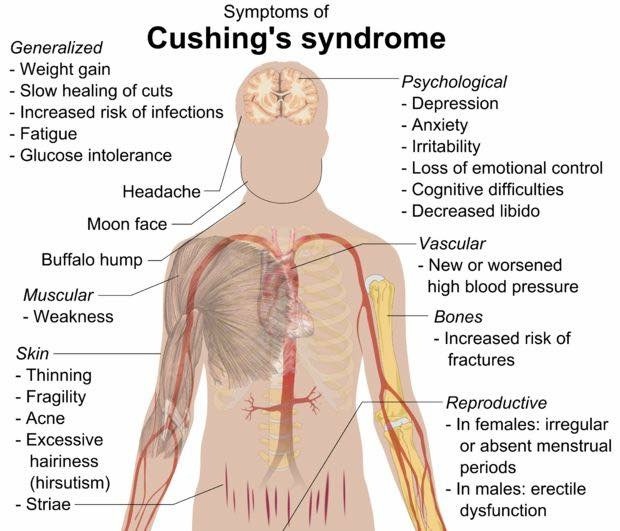 I noticed fairly early on that the symptoms listed on the websites of the major medical centers didn't quite reflect all the symptoms that I and my friends on the Cushing's message boards faced daily. The medical sites always listed their top 10. 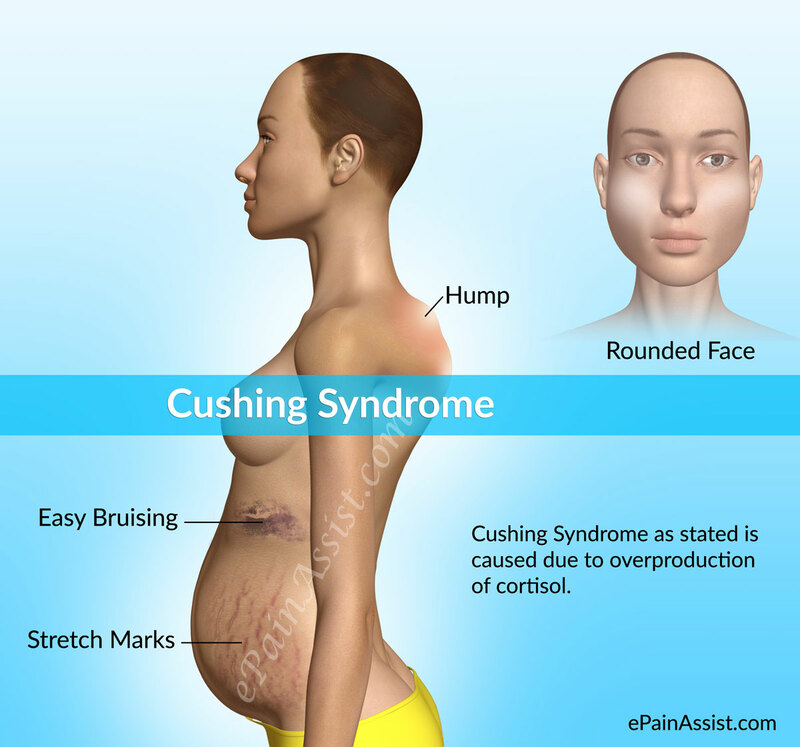 This has always perplexed me, because it is widely known that Cushing's, or excess cortisol, affects every cell and system in the body. Therefore, those medical sites doesn't really cover the extent of the damage we patients know that uncontrolled, excess cortisol causes. 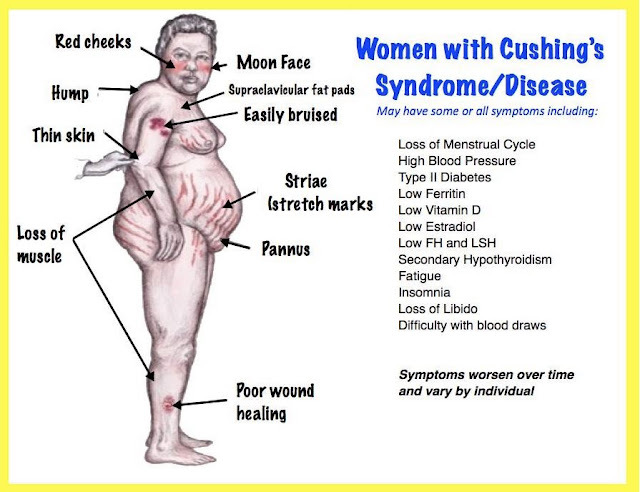 Pituitary Network Association's "list of the top pituitary and hormonal health hospitals in the world"
We Cushing's patients have such an acute awareness of Cushing's oftentimes because we are driven to figure out what is wrong with us. We ask each other online if the strange symptoms we have can actually be caused by excess cortisol or other disruption to the hypothalamus-pituitary-adrenal axis, also known as the HPA axis. So many times, doctors have scoffed at us or outright laughed at the mere suggestion that a symptom we question could be related to excess cortisol. Scorned, we turn to the Cushing's community for validation, and we usually get it. The pituitary is the master gland and controls the hormones made in the body. You can sure bet that there are many more symptoms that Cushies commonly face than the medical community is presenting to us. Eleven years is a lot of time I've been reading Cushing's stories online, and that is one thing I know for sure. To rectify that and to educate as many patients as I can about this deficiency, I have prepared the following list over the past several years. I haven't published it before now because it took me a while to remember all the symptoms. Now, I feel it is 98% complete, and that has to be good enough for me to post. From this list of 80 symptoms, how many don't apply to you? Please take note of which symptoms do not apply to you. So as the table shows, you could go through this list, not have THIRTY symptoms, but still have nearly TWO-THIRDS of the symptoms of Cushing's. That is really quite remarkable. Please use this list to pursue a proper evaluation for Cushing's and any disruption to the HPA axis. 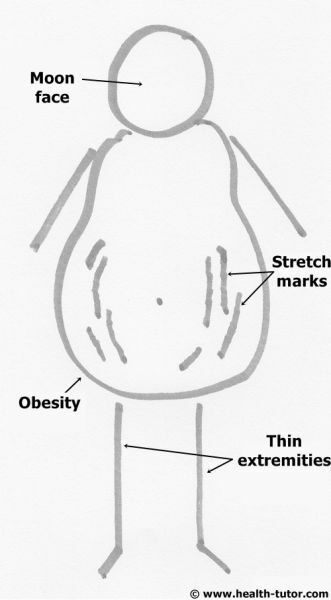 Before I reveal the list, I thought I'd show you the plethora of diagrams showing these freakish changes high cortisol causes. Even these diagrams vary! 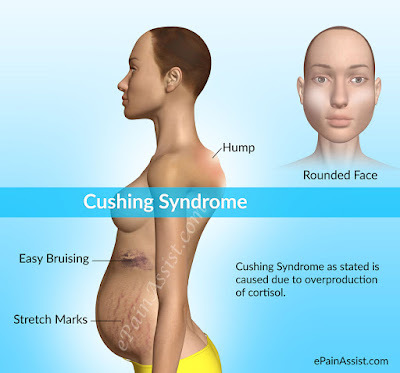 I am convinced there is no way to make an infographic that lists all the related Cushing's symptoms. There are just too many!! Do you see yourself in these images? 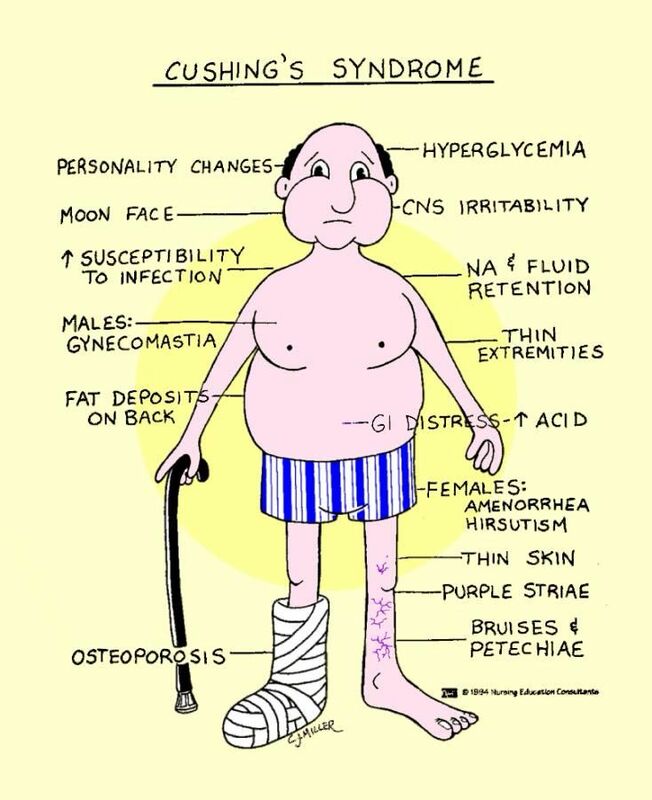 ●The underlying cause of Cushing's syndrome"
MUSCULOSKELETAL CHANGES: Excess cortisol causes the muscles of the upper arms and legs/hips to become weaker. HEART ISSUES: Excess cortisol raises blood pressure and puts stress on the heart and vascular system. That is quite a list, right? High cortisol really put our bodies through the ringer. What do you think? Did I miss any symptoms? Feel free to comment below and tell me. I'll research your suggestions in pubmed and Google Scholar, and maybe I'll add it to the list! In the future, I hope to hyperlink each symptom in the list to other sites that mention the symptom's relationship to the HPA axis. To print this list (will return to provide this), go to this version which omits the Cushing's body graphics. 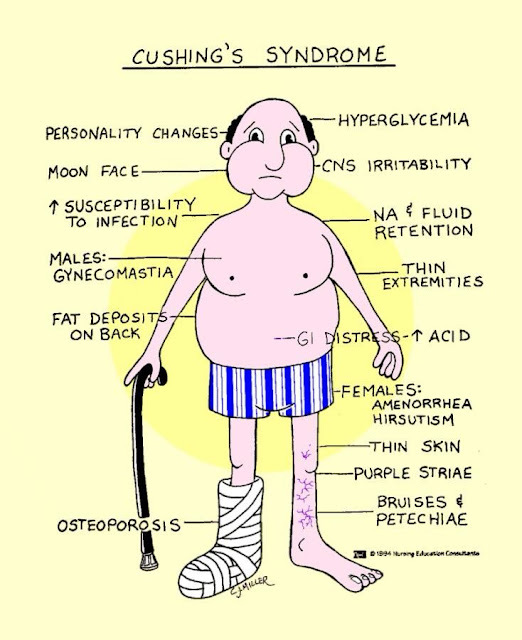 Be sure to read my article, "Gambling on a Cushing's diagnosis" which can help you convince your doctor to send you to an endocrinologist or test you based on the probability that you have all these symptoms at the same time. Be sure to like my facebook page: Fight Cushing's with Moxie to be the first to get new articles I post here on my blog. Also, feel free to search for me on Facebook at Moxie MelissaTX or moxiemelissa at symbol gmail dot com. I am happy to answer your questions, help you find the right type of group for online patient support. We even have groups for patients in every US state! There are Cushies everywhere. Be sure to create a safety net around yourself and get support. No one understands how terribly devastating and life-altering Cushing's is like other Cushing's patients.